I had a need to move some of the logs and limbs that have not yet been split for firewood to make room for a new acquisition. 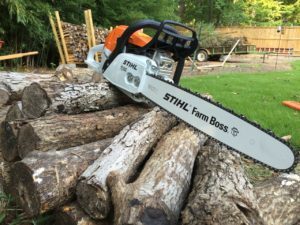 This was a good opportunity to put the new chainsaw to work and see what it can do. It took me a few tries to get the saw started, apparently I didn’t read the choke portion of the manual well enough, but I got it running in short order.